A top government ethics official is taking issue with a White House waiver that allows chief strategist Steve Bannon to talk to the news organization he used to run. Walter Shaub, the director of the Office of Government Ethics, told lawmakers in a letter Tuesday that the waiver was "problematic" because it isn't signed or dated and "purports to have 'retroactive' effect." That language "is inconsistent with the very concept of a waiver, which is to take decisions regarding the appropriateness of an employee's participation in covered matters out of the employee's hands," Shaub wrote. The White House on Thursday criticized Shaub's characterization. "We find it rather difficult to fathom what could be 'problematic' about permitting staff to communicate with the media," it said in a statement to CNNMoney. "In fact, numerous officials from the previous administration who had worked in media -- including White House Press Secretary Jay Carney -- freely communicated with the media and never even bothered to seek a waiver from potential conflicts." Shaub did not mention any concerns about the underlying purpose of the waiver -- only that it was made retroactive. The White House did not respond to a follow-up question from CNNMoney about that specific criticism. The White House statement went on: "The Office of Government Ethics needn't be concerned with how the White House implements its own conflicts of interest policy, over which it has zero authority." Shaub shot back in a statement to CNNMoney: "They expressed a different view when they were vigorously urging OGE to use its interpretive authority to issue two legal opinions on the Executive Order." The waiver applies to all top staffers in President Trump's executive office and does not mention Bannon by name. The letter was a response to Senate Democrats who had asked Shaub about the ethics requirements that apply to Bannon. It also isn't clear that Bannon took any action that would have violated White House ethics rules before the waiver was issued. The White House did not respond to a follow-up question about Shaub's concerns that the waiver was retroactive and neither signed nor dated. A Trump administration ethics pledge says the president's staff can't meet with their former employers or clients in most circumstances. A waiver, made public at the end of May, allows meetings with news organizations about "broad policy matters." Bannon was executive chairman of the far-right website Breitbart News until he joined Trump's campaign last fall. Ethics experts have told CNNMoney that, under the waiver, Bannon still wouldn't be allowed to talk to Breitbart about specific issues. For example, he couldn't advise Breitbart reporters about a request they make for documents. The waiver is retroactive to January 20, the day Trump was inaugurated. Shaub told CNNMoney earlier this month that there was "no such thing as a retroactive waiver." "If you engage in prohibited conduct without a waiver, you've violated a rule," he said. "Issuing a waiver after the fact won't change that. It's unclear whether a violation of any sort has occurred, but it's also unclear why a waiver would purport to be retroactive." 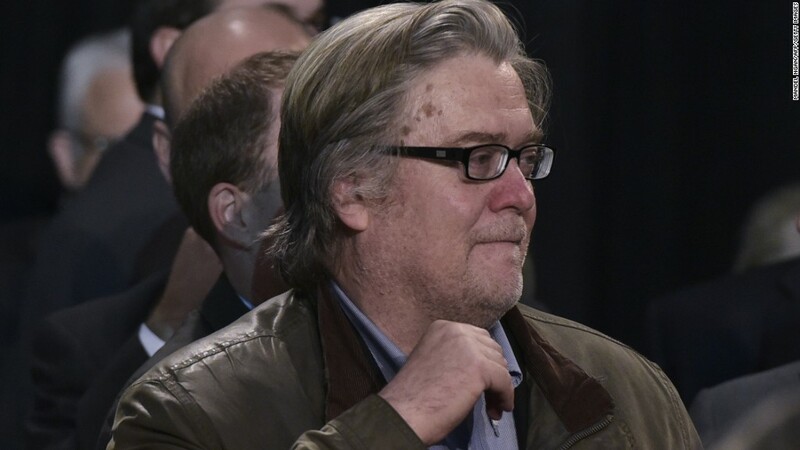 Neither Bannon nor the White House immediately responded to a request for comment from CNNMoney on Thursday. Shaub said in his letter that his office will prepare a report about the waiver. It will ask the White House and other agencies about whether they are aware of any violations of their ethics pledge as part of that report. --CNNMoney's Cristina Alesci and Dylan Byers contributed to this story.